Somewhere between my meyer lemon tree and a stack of sweet potato vines, sits my Moro blood orange tree. Unlike the lemon tree, it hasn't produced any flowers this season but there are tiny little leaf buds between each and every portion of the stems of this little tree. 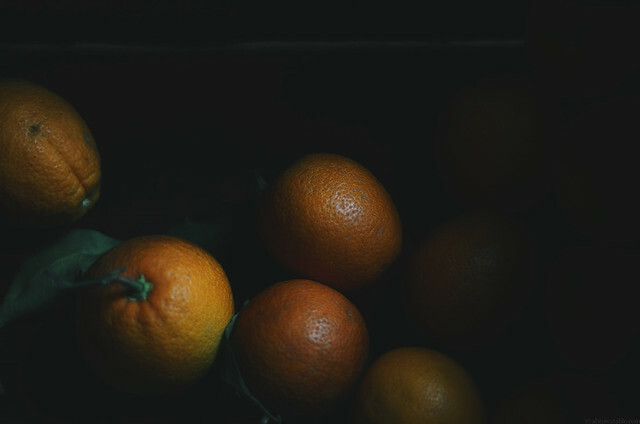 So until the day arrives that this plant will hopefully produce some fruit, I make do with ransacking the stores and markets in the neighborhood for the blood oranges. And some of those blood oranges went into making this sauce to be drizzled over this pudding. Ahh, how I love puddings! They are convenient and comforting yet can be made fancy to suit one's needs. I like to think there's something sweet waiting for me in the refrigerator when I come home after work, so every now and then I'll make up a batch of puddings that will satisfy my sweet cravings. 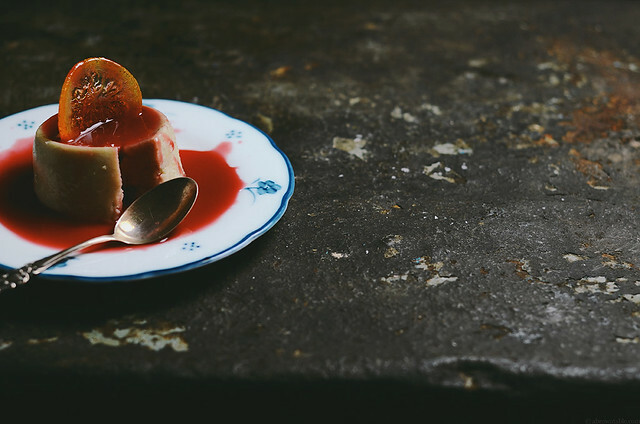 This pudding is made with sweet polenta and the creamy delicious flavors of coconut and almond milk and there's also a lightly burned caramelized blood orange sauce that goes over the pudding. Happy flavors and tasty puddings. 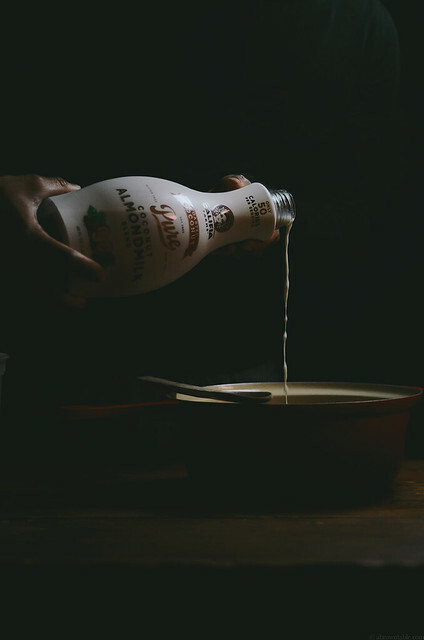 By the way this Califia coconut almond milk combination is rather delicious! 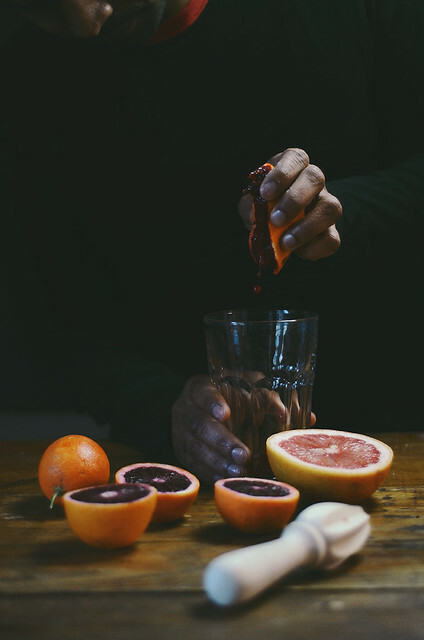 You can skip blood oranges and use regular oranges to prepare the sauce. Remember to adjust the sweetness of the sauce accordingly. The puddings will rise during baking and then sink a little after they are chilled. I trim the crust off the exposed end of the pudding to give the dessert a smooth finish. I gently bake the pudding for about 2 hours in the oven at a lower temperature so it doesn't burn but helps to get rid of most of the liquid. You can adjust the sweetness of the dessert to your liking by changing the amount of sweetener added. 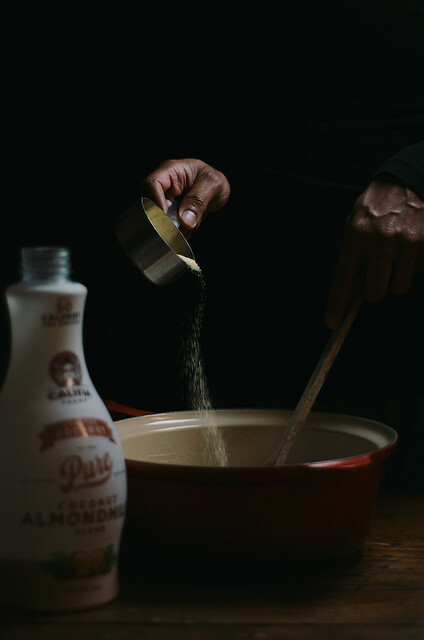 Place the brown sugar in a small thick bottomed saucepan and heat on a medium-high flame for about 3 minutes until the sugar just begins to darken and caramelize (watch the sugar carefully to avoid it from burning). As soon as the sugar begins to caramelize, remove the saucepan from the stove and carefully stir in the orange juice. Return to stove and stir until the caramelized sugar has completely dissolved. While the sauce is cooking, stir the cornstarch and water to form a slurry in a small bowl. Stir this mixture into the sauce and quickly whisk. Continue to cook with constant stirring, the mixture will begin to thicken and begin to boil. Continue to stir constantly and cook for one additional minute. Remove the saucepan from stove and pass the sauce through a sieve to remove any clumps. Transfer the sauce to a container and refrigerate until completely chilled. Add all the ingredients from the polenta to the sugar in a large thick bottomed saucepan. Bring the contents of the pan to a boil on medium high heat and then reduce the heat to a medium-low. In a small bowl, mix the cornstarch and water to form a slurry and fold this slurry into the polenta. Raise the heat to medium-high and cook and stir the the polenta until there is little to no visible liquid left, this should take about 8-10 minutes. The mixture should resemble a thick porridge like consistency. Remove from stove. Grease 4 X 4 ounce heatproof glass canning jars with a little coconut oil. Using a ladle fill the jars up and using a spoon flatten the mixture to release any trapped air bubbles. Bake the jars for 2 hours at 250F on a baking sheet on the middle rack of a preheated oven. Rotate the tray halfway through the baking process. Remove the hot jars and allow to cool to room temperature. Wrap the mouth of each jar with cling film and refrigerate until chilled for at least 3-4 hours. The puddings will shrink a little in the refrigerator. To release the puddings, run the blunt edge of a knife between the jar and the pudding. Tap the jar over a plate to release the pudding. Trim off the crusty end of the pudding using a sharp serrated knife and place the pudding in a serving plate. 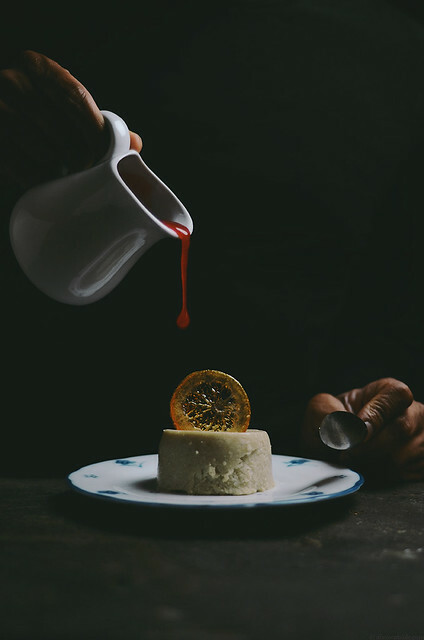 Garnish the pudding with a candied orange slice and drizzle generously with the burnt sugar blood orange sauce. Prepare the remaining three puddings similarly.